Listen to Rihanna’s advice and shine bright like a diamond with help from these brilliant wrist adornments that combine Swiss watchmaking with innovative gem-setting skill. Crafted in white gold, this handcuff watch boasts a serpent’s head in a striking pose. 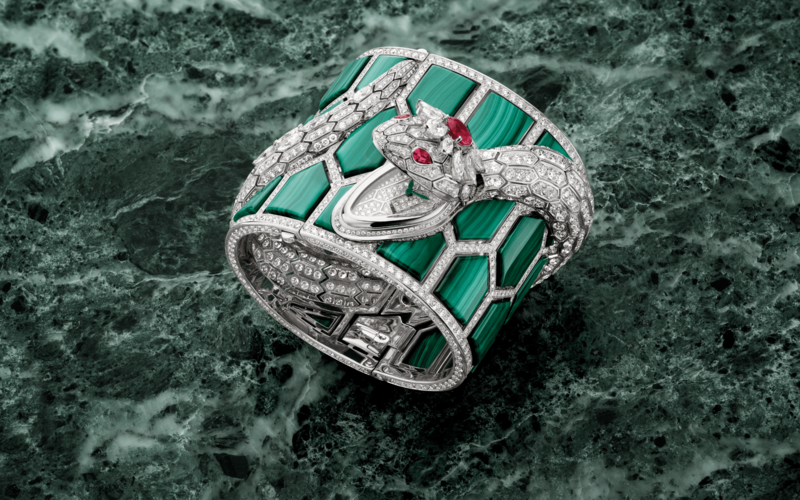 Fuelling its exuberance are 30 malachites, 18 marquise-cut and brilliant-cut diamonds as well as two pear-shaped rubellites for the serpent’s eyes and one round rubellite on its head. It’s a double dose of the French house’s signature panther on this wristwatch shaped out of two felines with their paws meeting around the dial. The intricate composition of white gold, brilliant-cut diamonds, onyx spots and emerald eyes gives the cats an opulent twist. Whoa, Bulgari Reveals Impressive New Facade At Pavilion Kuala Lumpur, And We're Mind-Blown! Set entirely with brilliant-cut diamonds for a total of 30.1 carats, the 1970s-style oval case shape is matched with an Australian opal dial that enchants with its natural inclination to change colours. The shimmer of red sapphires on the bezel and diamonds on the lugs beautifully complements the celestial constellation of zodiac signs on the dial. In a showcase of the maison’s métier d’art, all 12 signs were delicately enameled in silver on a red dial. The undulating waves on the dial are crafted in the proprietary 18k Sedna gold and paved with 191 diamonds. The hour markers are marquise-cut rubies while the bezel glitters with diamonds. But it’s not just a fine-looking jewellery watch as it is also endowed with the robust Master Chronometer Calibre 8807 that offers superlative precision, performance and anti-magnetic resistance. A unique piece, the 18k white gold case dazzles with two cushion-cut Sri Lankan emeralds, 14 marquise-cut emeralds and 32 brilliant-cut diamonds. The dial is opal in colours that match the green and blue of the precious stones.